Confession time. 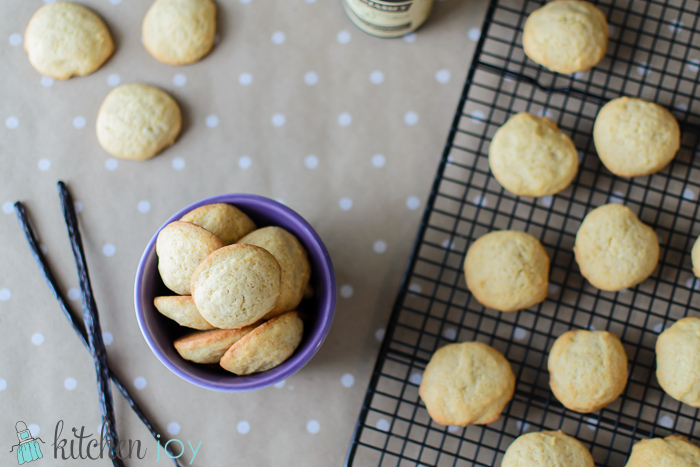 Vanilla wafers are my favorite boxed cookie. I just love them. I usually eat them plain, but when I’m really feeling fancy, I like to spread Nutella between two of them and make little sandwiches. Sigh. It only made sense to me to try a from-scratch version, considering I’m kind of on a make-store-bought-things-at-home spree right now. (Do I need to remind you about the English Muffins? They’re a hot commodity around here these days.) These cookies taste SO much like the “real” thing except with REAL ingredients, and no chemicals or High Fructose Corn Syrup. They have a little bit more of a rustic, homemade appearance than the ones from the box, but that’s okay with me. 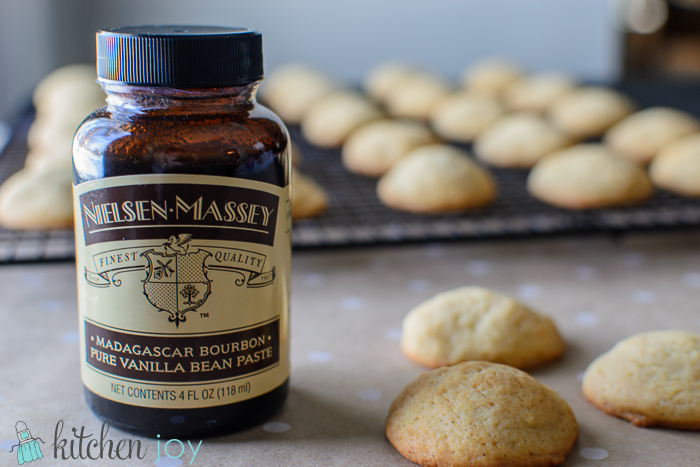 This is the first time that I’ve used Nielsen Massey’s Madagascar Bourbon Pure Vanilla Bean Paste after reading about it online. I ordered mine from Amazon, but I’m sure it’s available other places. I haven’t come across it in stores around here. So far, I LOVE it. If you do the math, it’s actually much more affordable than buying whole vanilla beans all the time. 1 tablespoon = 1 whole vanilla bean. The texture is thick and syrupy, which is a nice way to add a punch of vanilla flavor without thinning out your recipe too much, plus because it is made with real vanilla beans, it adds that characteristic vanilla bean “speckled” look that let’s you know you’re in for something great. 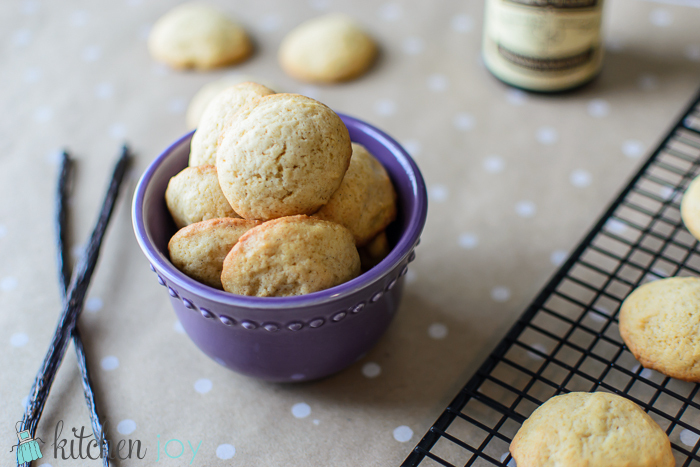 For this recipe, I used both Vanilla Bean Paste, and pure Vanilla extract. 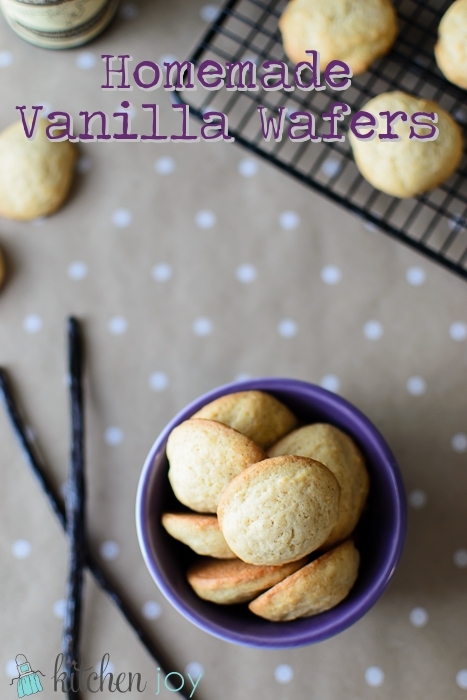 These Homemade Vanilla Wafers are definitely not lacking in their vanilla flavor. If you don’t have Vanilla Bean paste, you can use 1/2 of a vanilla bean instead. Sift together the flour, baking powder, and salt in a bowl and set aside. Beat the butter and sugar in the bowl of a stand mixer fitted with the paddle attachment on medium speed until light and fluffy, about 3 minutes. Scrape down bowl, then mix 30 more seconds. Add the egg, and mix on medium speed for 1 minute. Add vanilla bean paste (or vanilla bean seed), the vanilla extract, the milk, and the honey and mix on low for 30 seconds, or until fully incorporated, scraping down bowl as needed. Add flour mixture, and mix on low just until incorporated. Cover and refrigerate the dough for 15 minutes. Position oven racks in the upper and lower third of the oven. Preheat oven to 350 degrees F.
Scoop chilled batter in teaspoon-sized portions about 1 1/2-inches apart on two baking sheets lined with Silpat baking mats or parchment paper. Bake until golden, about 12-15 minutes, rotating sheets halfway through baking. Allow to cool on the baking sheet before removing. Store in an airtight container for up to 5 days. Note: If you seal the cookies into the airtight container while they're still slightly warm, they will turn out a bit softer/chewier than if they are allowed to cool completely. They taste great either way. Disclaimer: I am in no way compensated or affiliated with any product or brands that I mention in my posts. I do not receive free products. I have come to love the products that I share naturally. If you happen to already use Amazon for purchases, by purchasing via some of the links on this site, I can earn a few pennies via my Amazon Affiliate account. No added cost to you.